What does WAI-ARIA stand for? WAI-ARIA stands for "Web Accessibility Initiative - Accessible Rich Internet Applications"
How to abbreviate "Web Accessibility Initiative - Accessible Rich Internet Applications"? What is the meaning of WAI-ARIA abbreviation? 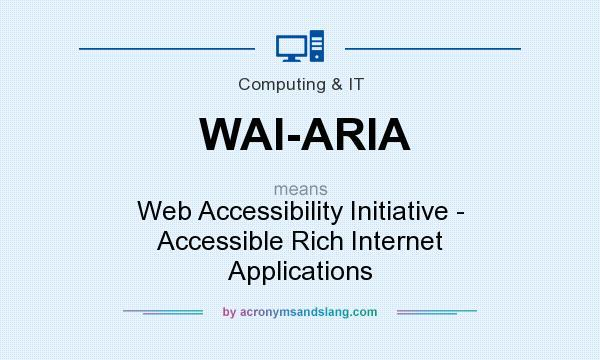 The meaning of WAI-ARIA abbreviation is "Web Accessibility Initiative - Accessible Rich Internet Applications"
WAI-ARIA as abbreviation means "Web Accessibility Initiative - Accessible Rich Internet Applications"